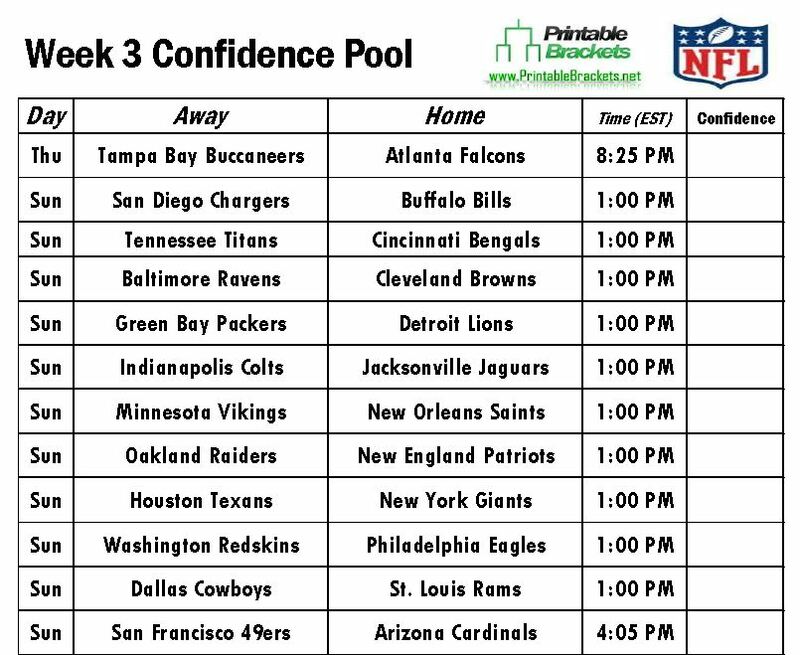 Longtime NFC South rivals will be on the same field in the first game on the NFL Confidence Pool Week 3 sheet, as the Tampa Bay Buccaneers will take on the Atlanta Falcons on “Thursday Night Football”. Both the Falcons and Buccaneers are coming off disappointing 2013 campaigns. Just a year after posting the best record in the NFC, the injury-riddled Falcons went 4-12. Beset by problems at quarterback and conflicts with now fired head coach Greg Schiano, the Buccaneers also went 4-12 in 2013. The Bucs and Falcons split last year’s season series, with each team winning on their home field. Meantime, the defending champion Seattle Seahawks will host Peyton Manning and the Denver Broncos in a rematch of Super Bowl XLVIII in a featured Sunday matchup on the NFL Confidence Pool Week 3 sheet. The Seahawks demolished the Broncos, 43-8, to claim their first Super Bowl title in franchise history. In other action, Aaron Rodgers and the Green Bay Packers will be on the road to face Calvin Johnson and the Detroit Lions, Robert Griffin III and the Washington Redskins will be in Philadelphia to face the Eagles, while the Arizona Cardinals will play host to the San Francisco 49ers.